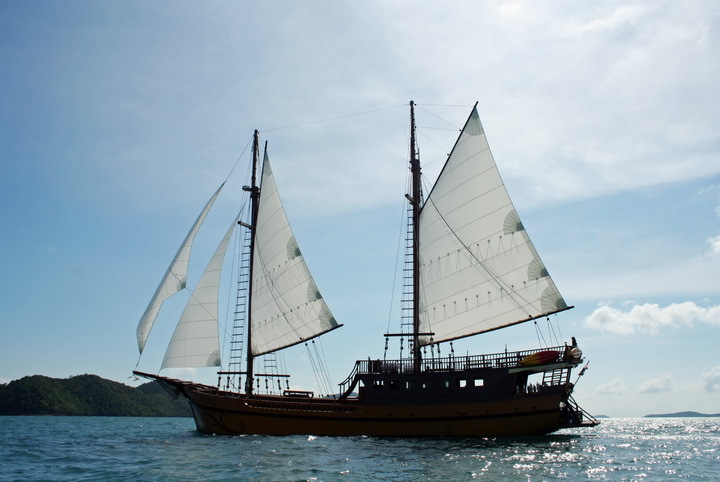 Diva Andaman is the best liveaboard diving in Burma. 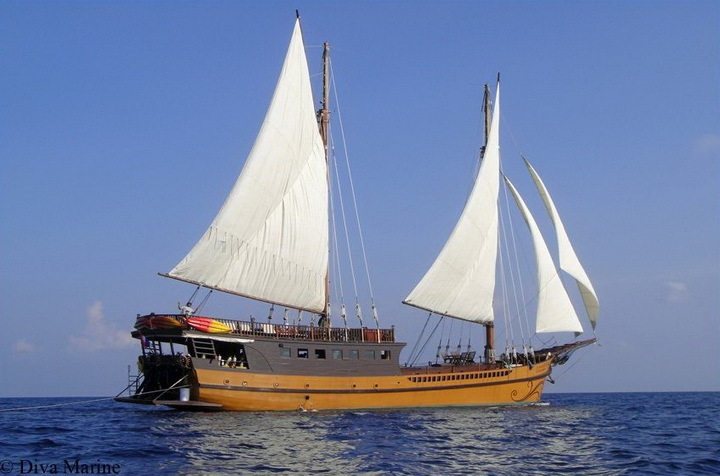 It offers luxury liveaboard diving cruises to the Mergui archipelago and Burma Banks. (It also runs Thailand only trips). 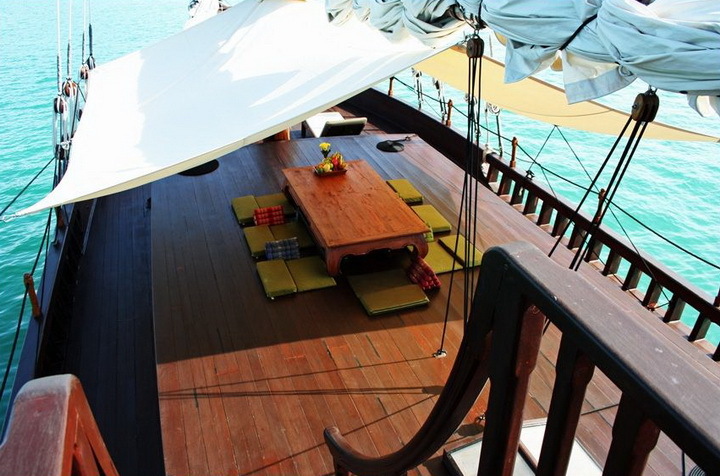 The classic sailing yacht adds a touch of romance to your Burma diving cruise. Enjoy beautifully appointed cabins, delicious Asian and international cuisine and fine wines as you cruise some of the most beautiful scenery in the world. 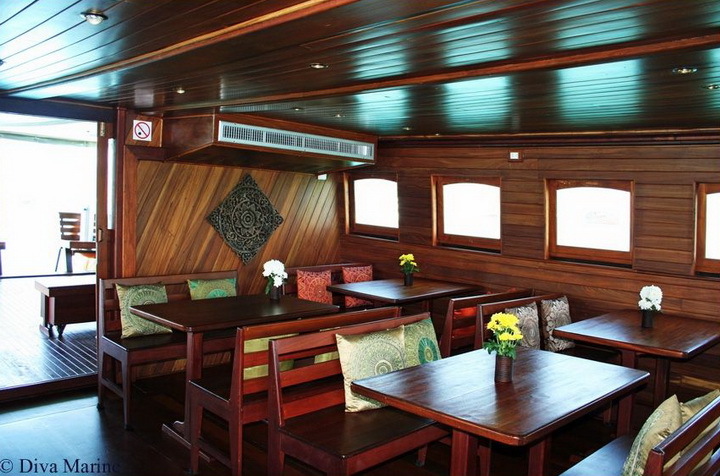 The level of service and the quality of the cabins is the best of all the Burma diving liveaboards. 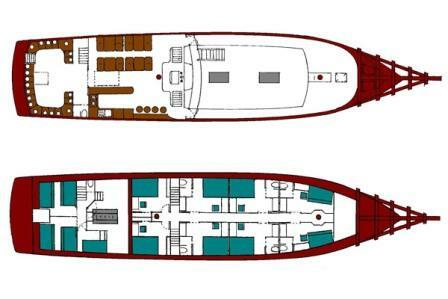 At 35 metres length and taking just 14 guests you are assured of personal service and plenty of space on board. 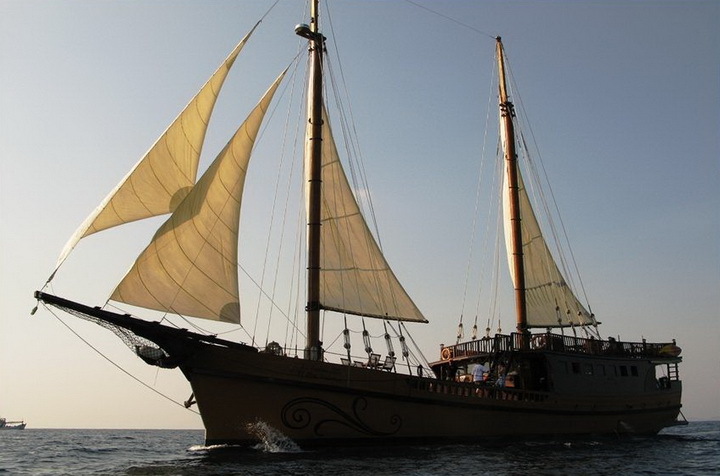 Snorkeling and kayaking also form part of a Diva Andaman cruise. “The Diva Andaman was an excellent adventure. Thank you Thailand Liveaboards, and thank you Paul! 400 square metres of sail area supported by a 425hp engine. Max 14 guests in 7 air conditioned cabins. 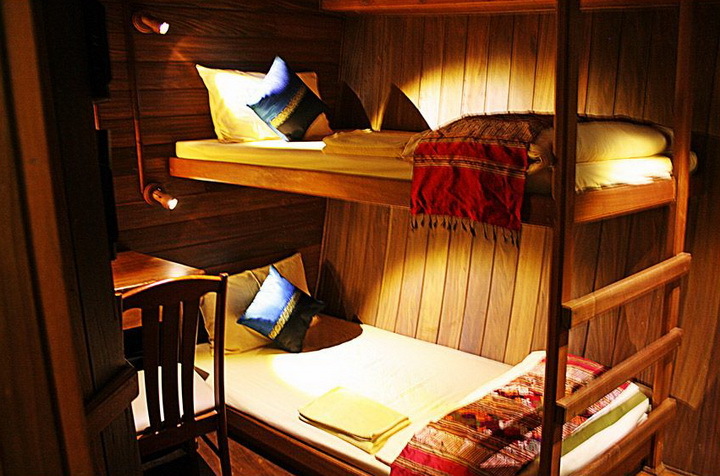 There are 5 cabins with double bed and two twin bed cabins. 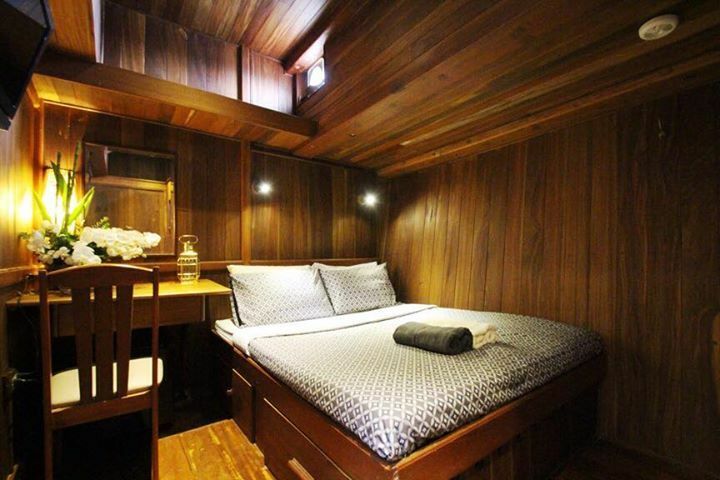 Each cabin is beautifully furnished and has a private bathroom, a fridge, a safety box and an LCD TV. 2 tenders (RIBS) for quick pick ups after the dives and for taking guests to island beaches. Delicious Thai and international food. Price includes a full set of top brand dive equipment including dive computer. Good value single cabin option. Dive guide, dive equipment, kayaking, all meals, soft drinks. National park fees, Mergui entry fees (US$250), Nitrox (275 baht per fill), alcoholic beverages, Thai massage. 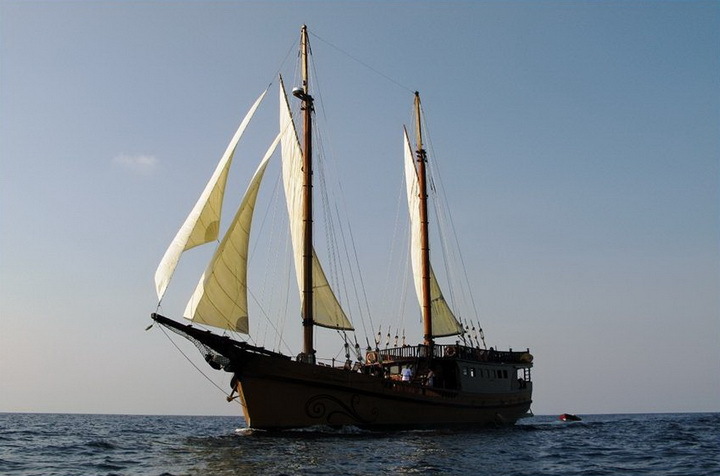 How to book this liveaboard: For advance bookings pay 30% deposit now to confirm your place, the balance is due 90 days before departure. Tell us the dates you want to book and we’ll email you booking instructions detailing inclusions, exclusions, payment schedule and methods. We accept major credit cards, paypal or bank transfer. We do not charge a fee for card payments. Day 1: Board Diva Andaman at Ranong pier at 1300 hrs. Thai immigration procedure then cruise to Kawthaung for Burmese Immigration procedure. Dinner on board while cruising into the Mergui archipelago. Day 2: 2 morning dives at High Rock and Rocky Island then cruise to 3 Islets for 2 afternoon dives. Evening cruise north to Black Rock. Day 3: 4 dives at Black Rock then cruise to Burma Banks in the evening. Day 4: 3 dives at Burma Banks then cruise to Fan Forest Pinnacle. Day 5: 2 morning dives at Fan Forest Pinnacle then 2 afternoon dives at Western Rocky. Day 6: 2 morning dives at Western Rocky pinnacle and 2 afternoon dives round Western Rocky Island. Cruise to Kawthaung in the evening. Day 7: Burmese Immigration procedure on board in Kawthaung then cruise to Ranong for Thai entry. Check out after breakfast at 10.00 hrs.